One of the damaged buses. 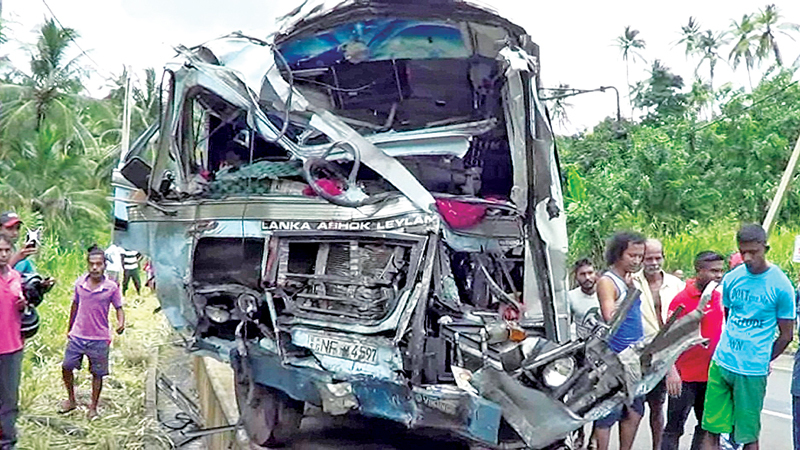 Sixty people were injured and hospitalized following a head-on collision between two private buses on the Dambulla-Kurunegala main road in Panliyadda, Melsiripura yesterday afternoon. Among those injured were the drivers of the two buses, a Buddhist monk and a Bikkhuni. About 20 people who sustained serious injuries in the accident were admitted to the Galewala, Kurunegala, Gokarella and Dambulla hospitals. Investigations have revealed that both buses belonged to the same owner. One of the buses involved in the crash had been plying from Embilipitiya to Jaffna and other bus was travelling from Vavuniya to Embilipitiya. Police suspect that the two buses had been travelling at high speed and the accident would have occurred while trying to overtake another vehicle. However, the passengers said that both drivers who were friends had been speeding and tried to overtake each other in an apparent race when the mishap occurred. Some of the passengers said that the two drivers were in the habit of flashing their lights at each other often when they cross each other on the road. Area residents said that they had heard a huge sound and had rushed to find that the two buses had collided. Residents helped dispatch the injured to hospitals in the area. Many of the injured passengers who were rushed to the Galewela hospital were later transferred to the Dambulla hospital and patients who were initially admitted to the Gokarella hospital were transferred to the Kurunegala hospital. Vehicular traffic was disrupted for about 45 minutes on the Dambulla-Kurunegala main road and the Gokarella and Galewela took measures to bring the situation to normality. According to an officer of the Gokarella Police Traffic Division, the reason for the accident is believed to be negligence while the two drivers were having fun teasing and challenging each other. Several seats in both buses had been dislodged and were thrown towards the front of the bus injuring some passengers in the process. Gokarella Police is conducting further investigations.